Another year, and a whole lot of changes happened in that time. AM2R advanced, not as much as planned but the great feedback you people sent me about the demo was very useful (Yes, the first Metroid will be easier). Work is now centered on the main menu, and adding the 3 save slots with their respective options. It´s already designed, but the stats of each save slot aren't working yet. A lot has changed in my personal life too. Besides the huge pride of being a father, I recently got a solid job offer to address our money issues. I´ll be programming ASP websites in C# for a consultant, and keeping the studio working. Of course, AM2R will always be my top free time project. Anyway. I want to thank all the great people who shows their support, who take their time to leave comments, write emails and participate in the forum. To all the people who contributed to the project: Spriters, mod makers, translators, beta testers, and you, for playing the demo. I wish you Happy Holidays, have a good and safe celebration with the people you love. Hey doc quick question How much do u estimate That when the game is finished(Hopefully Soon) how much hard drive space it will take and will u also make a mac version of the game? congrats on your new job offer. 2012 may be the time to play am2r complete! Merry Christmas Doc!!! Wow your family got some great presents this year! You and your girlfriend got a wonderful baby girl, and your daughter got an awesome guy for a father! Have a great new year!!!!! Merry Christmas Doc,to you and your new family. We owe you thanks for this outstanding project, and all the work that has been put into it. Merry Christmas, DoctorM64. Thank you for being always respectful and dedicated. About the game, you just surprised us all, especially for Samus' look, different from all 2D games, also more beautiful than all of them. - Samus' jumps are very noisy, when she rolls on air. Couldn't you make just the jump noise a little more silent? 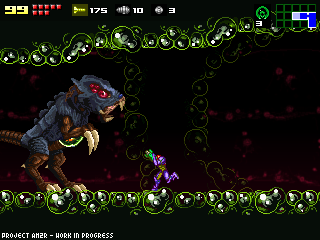 - I read that some people liked my idea of showing the Parasite X starting to infect animals with a dark soundtrack, after the game credits, to remind us of Metroid 4. Please, do that, it would be nice. - Make more cutscenes. In the demo you didn't show any, but I think (I hope I'm right) you made some cutscene of Samus arriving for the full version. - Are there going to be difficult levels? Please, do it. For example, an Alpha Metroid has to be shot 6 times to die. In difficult we'd need 10... Some crazy players, like me, love challenges and I DO love to get pissed off. Been following the project since the first tech demo, always glad to see an update! Best of luck to you. I was glad to be of assistance. Those few Mods I did were fun. Hope there is mod support for the full game. And another thing, Samus' sprites look great but they have strane things like her legg suddenly growing twice in width and such plus the green lights that oters already mentioned. Despite de fiendish dificulty and awkward sprites of Samus the level design left me breathless, as well as the music. All that polishing was definitely worth it. gracias por el exelente trabajo... pero cuando termine, podria ayudar a FSMR por favor y si en algo puedo ayudar pues estoy para servirle. Feliz navidad y feliz años nuevos para ti también!! Mucho exito en todos tus proyectos tanto personales como laborales. Y en serio, muchas felicitaciones por esa demo que sacaste, me la he pasado como 5 veces y no me canso de ella. Realmente a los fans de Metroid nos da una gran alegría al saber que se hace un remake tan bueno del Metroid 2. Thanks Anyways for the Good Work ! Easier would chew donkey nuts. Something I forgot to adress on the previous comment: I loved the dificulty, it reminded me of the original Metroid 2, but I understand that others find it very frustrating. It'd be cool if I could choose an option to fight them in the harder dificulty. Like you, I had big holidays this year. So happy holidays and don't forget to breathe. Hey. The first Metroid is already easy. Check out for the lower part of each one. I encountered this "weakness" and abused of it a lot. If you stay still and crouched, you can shoot the belly like a boss. Por cierto, olvidé que hablas español. Solo checa eso, los Metroid andan mal en esa parte. Una vez que agarras el ritmo, ni uno es reto para el jugador. Y te admiro, tienes el tiempo ocupado y puedes con el juego. Yo casi no tengo tiempo para mi juego de Megaman X.
Feliz años nuuuevoooo para ti tambien! y espero tengas muchas bendiciones para ti tu hijo y tu esposa se les quiere un monton mucha suerte en tus proyectos y sobre todo en el de am2r! HAPPY!! 2012! C#, huh? Wow, you must be following me around or something: I just got a job in that, too! Feliz an~o nuevo? Frohes neues Jahr!! OMG I make web sites too, if you need any help dot be afraid to ask me. -...did you NOT read what Doc said? He's making the Metroid easier. Not that it needs to be, considering you can just STAND THERE and waste it, but hey, if you need it to be a more simple cake walk, more power to you, I don't get how they were so friggin hard. But he's lowering the difficulty even more. I don't know what they will do now...maybe hatch and never move. Felices proyectos y felices dosmildoces! Falling out of excitement a little. A visit to the site and still no game! Oh how I wish the full game was out! Time to go back to waiting! hey do you think you can try and make it a game download for the 3ds? it looks so good! I can't wait until you finish with it! hey, i always wanted the 2d metroid games to do this, can you make it so that you can play as zero suit samus? like if you go to the start menu where you can toggle through your upgrades, you can turn the power suit off and play as zero suit samus. sorry for being confusing, i think. it would be cool as if you were to do it. and congratulations for being a new father! I'm glad that you're not affected at all by the MegaUpload shutdown. Can't wait to see AM2R finish. The internet is scarier than ever, and threats feel like they're everywhere. Also, I made a startling revelation: The Portal 2 menu music hares an eerie resemblence to the different Metroid themes. Also, Samuel should get updates from the Terran Interstellar Communications Department, including the occasional letters from fans, just to make you feel less alone. Maybe random advertisements and news articles should also come in along with the intel that the Federation gives you. Hola, solo tengo dos cosas que decir a cerca del demo... ES FENOMENAL!!!!!!!!!!!!! magnifico escenario, y la musica tiene una esencia semejante a como lo haria nintendo, solo tengo una pequeña acotacion, deberias colocarle el mismo sonido que le pusiste anteriormente a tu primer demo de AM2R, el de ahora tiene un sonido igual al de Metroid Zero Mission cuando Samus toma un Misil. Metroid 2 se caracterizaba por tener sus propios sonidos y muchos detalles que otros metroid nunca mas tubieron, debes mantener ese canon, asi llegarás a la esencia real del original metroid 2. Saludos amigo y que todo salga bien, avanza harto, es un demo increible. You know, you seem to be entering the "EVERYTHING ELSE MUST BE PERFECT BEFORE THE FINISHING TOUCHES ARE APPLIED!!!" phase. Good luck getting out of that deep well. Keep up the great work! Also, hope everythings going well for you new family wise. I also hope this project never dies ;) I can handle a slow pace, so long as we get to see this in the end, too much epic work to die now!!! hows the work coming on AM2R? Jesus .. whats with all the people requesting X/Y/Z to be in the game? Do you guys REALLY want him to take an extra 3-6 months just to add your vanity features? Christ! .. let the man make his game! Just read about this project in a magazine! It's incredible. I love the Metroid series but could never get along with the GB one, hoping this will change all of that! Hope you can find the time to see it through whilst enjoying your new job and fatherhood. I meant to say Samus, not Samuel. Similar to when I tried to type "has" but the Kindle wrote "hares". I'm sure Doc is quite busy with his new family, but an update would be appreciated. This is the first time in a while he's taken well over a month to tell us anything. Just let us know that you're there and everything's alright, Doc? We all want this project to be finished so badly, and you don't seem far off. Patience may pay off, but many projects that take too long get lost in limbo as well. Please don't let this happen to this one!